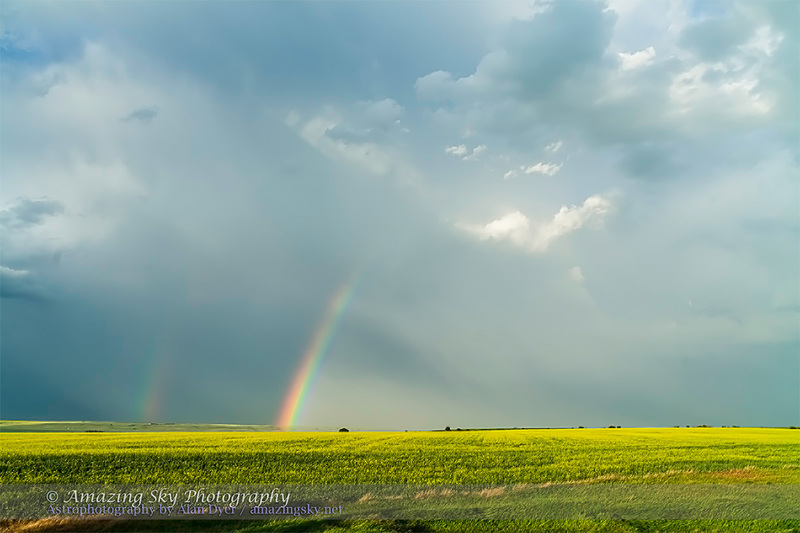 A horizon-hugging rainbow shines over a blooming field of canola. You don’t often see a rainbow like this. 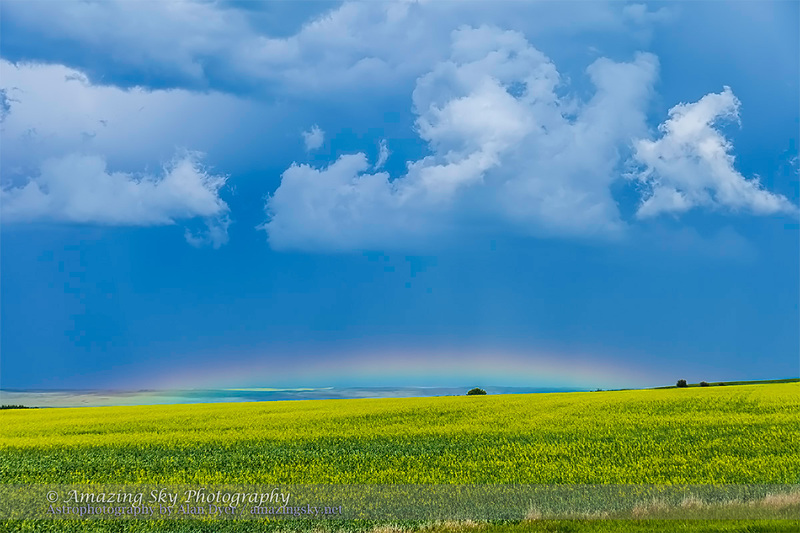 Just the top of the bow pokes above the horizon and a field of yellow canola. The reason is the Sun’s altitude. When I shot this in late afternoon yesterday, July 4, the Sun was 40 degrees up in the northwest. That means the point opposite the Sun was 40 degrees below the horizon in the southeast. Rainbows are centred on this anti-solar point and are always 42 degrees in radius. So doing the math shows that only the top 2 degrees of the rainbow arc could be visible above the horizon, creating a rainbow chord. Later in the evening as another storm receded, a more classic bow appeared, this time as a double rainbow. With the Sun now much lower the anti-solar point was higher and more of the semi-circular bow appeared in the sky. I wish I could have shot a time-lapse of “rainbow rise” but downpours of rain prevented me from leaving the camera out. These are neat examples of the play of light and colour in the open air. For lots more information, check out the wonderful Atmospheric Optics website. Very nice Alan. 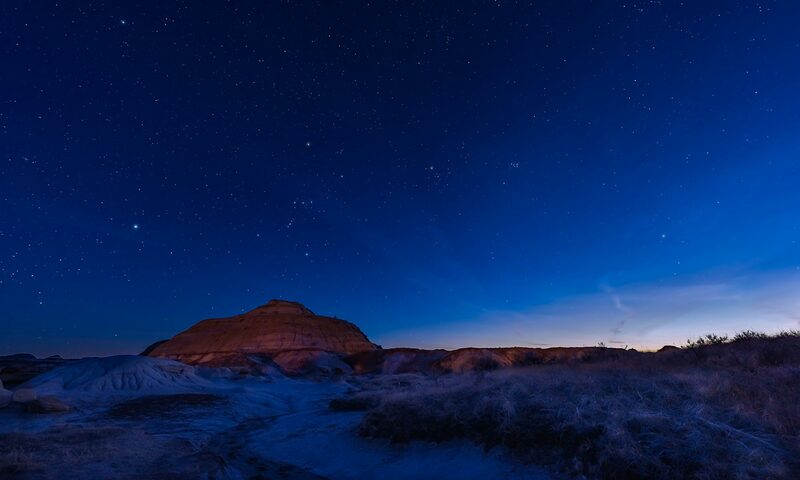 Makes me pine for Alberta skies.